Gordon is a rural township 23 km east of Ballarat and 80 km north-west of Melbourne. Once on the Western Highway, it is now a few kilometres south of the Western Freeway. The town was named after George Gordon who settled in the area in 1838. The locality came to prominence in 1858 when gold was discovered five years after the discovery at Mount Egerton, about 5 km to the south. Known as Gordon's for some time, the settlement was a collection of huts with a post office and a court house, until a township was surveyed in 1860. A sawmill (1863) provided timber suitable for town buildings, coinciding with farm selections being taken up, often by Irish settlers. An early Catholic church was opened in 1864 (on the site of the future public hall), and a more substantial replacement was built in 1875, west of the town. A school was opened in 1873, and a Catholic school in 1884. 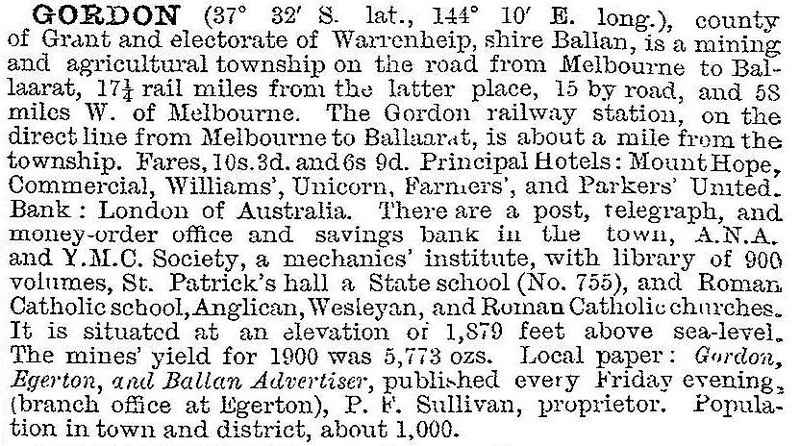 Between 1879 and 1886 Gordon was a terminus for the railway from Ballarat. (The line from Melbourne to Ballarat was via Geelong until a connection from Gordon to Melbourne via Bacchus Marsh was completed in 1889.) The completion of the line to Melbourne coincided with a decline in mining, and Gordon's prosperity came to also depend on agriculture. St Patrick's church was built in 1888. In 1916 the Mount Hope Hotel and several buildings were burnt down. Mining at Gordon's gold mine continued however, its workers fielding two district football teams during the 1930s – the surface and the underground teams. From 1930 to 1990 Gordon's population was in the 200s. During the 1990s it grew to over 370, as its proximity to Ballarat and Bacchus Marsh put it within convenient commuting distance to either. Gordon has Anglican and Catholic churches, Catholic and State schools (State school, 90 pupils in 2014), a hotel, a mechanics' institute hall (1868), an art gallery in a former bank (1876) and the Gordon-Mt Egerton water supply (1981). Agriculture, mainly potatoes, is irrigated.